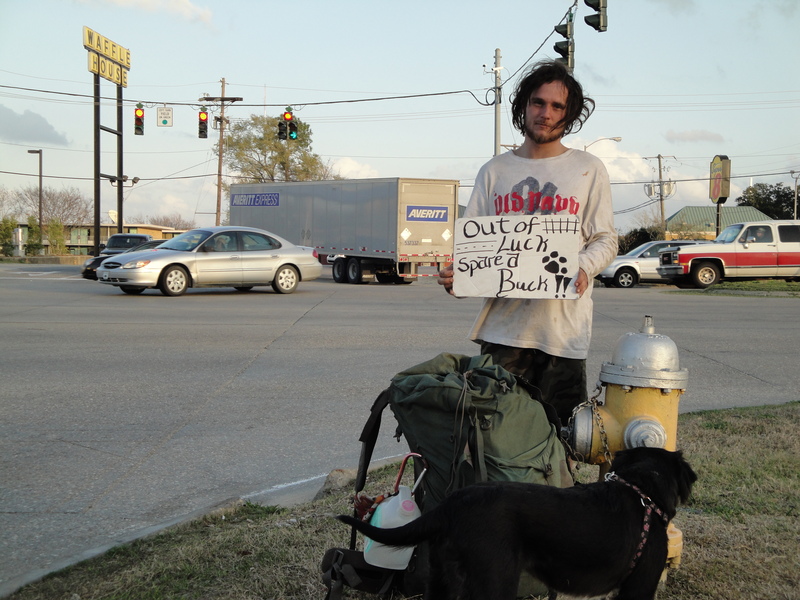 Donny Finnegan, 20, has spent the past year traveling across the United States with his girlfriend and their three dogs. It has not been for business. It has not been for pleasure. It has been for necessity. Finnegan lost his job almost two years ago in California. He and his family-of-sorts have been hitchhiking ever since. Finnegan and his girlfriend are two of the nearly 672,000 people who are homeless on any given night in the U.S. Of that statistic, 92 can sleep on beds at a Bishop Ott shelter. The shelter, operated by the Society of St. Vincent de Paul, opened December 1991 on Plank Road. Within the next decade, it expanded to a men’s day center and night shelter and a women and children shelter, both on Convention Street. Iris Taylor, shelter director for the women’s shelter, said she decided to work with the women’s shelter because she knows how difficult it is for women struggling to raise a family. Taylor is one of ten people on staff at the Bishop Ott shelters. The rest of their help comes from interns and volunteers. Groups of coworkers, church members, friends, etc. cook a meal and bring it to one of the three shelters for the Manna Givers program. Taylor said that by providing dinner every night, these groups of volunteers save St. Vincent de Paul a “tremendous” amount of money. “It’s the biggest and best gift anybody can give us,” she said. Kimberly Jackson has been receiving meals from Bishop Ott for two weeks. She spends her nights at the St. Agnes shelter and rides the Bishop Ott Day Center van every day. 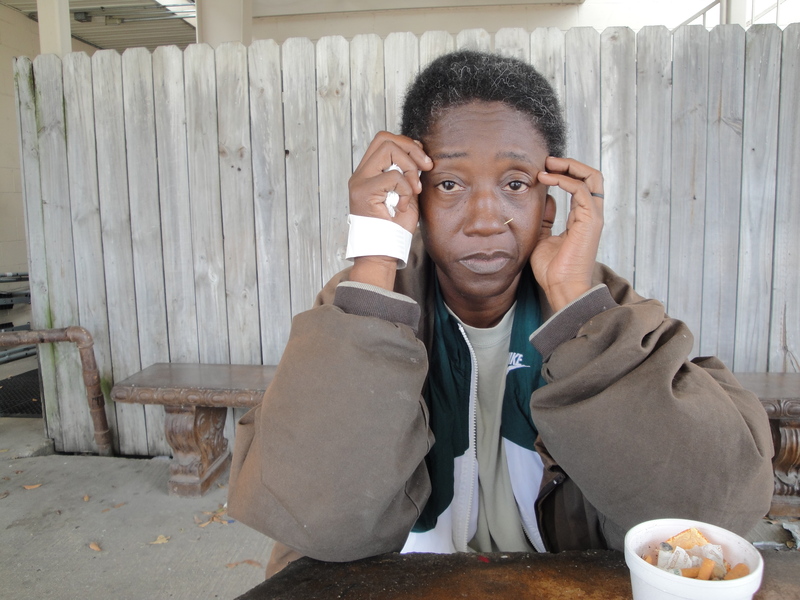 Jackson moved to Baton Rouge a year ago to escape an abusive relationship; she has been homeless ever since. Through the shelters, Jackson has meals, a bed, and the opportunity to look for a job. Jackson said she lost custody of her three children when she went to jail. She is currently striving to obtain a job and an apartment so she can get her children back. 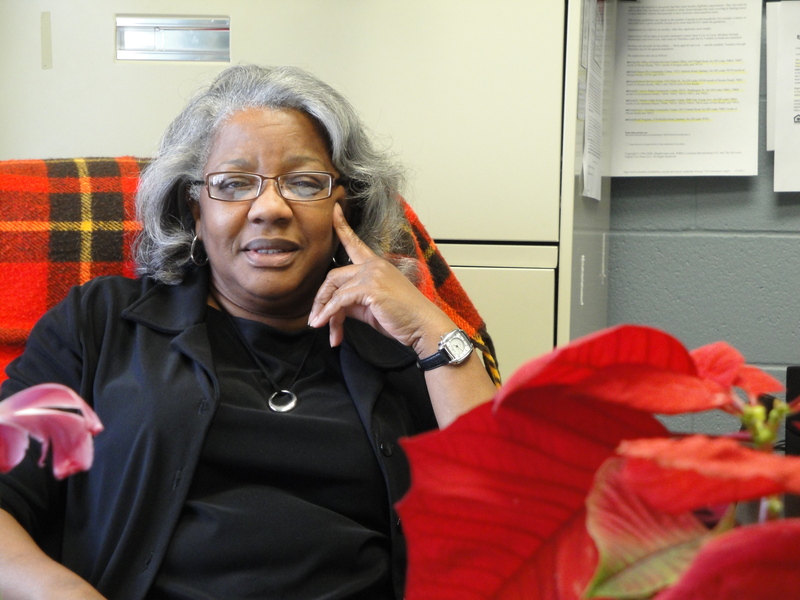 “[I’m] trying to find a place where I can get my children and take care of them,” she said. Catherine Sens, LSU political science senior from New Orleans, coordinated a housing project between Volunteer LSU and the Capital Area Alliance for the Homeless in late February. Sens, the Civic and Social Awareness Chair of VLSU, said the organization is working with the 100,000 Homes project to put the most vulnerable homeless individuals into apartments and other housing. Sens said the project attracted 57 volunteers – a number larger than she expected for VLSU’s first dabble in homelessness. Finnegan said that he and his girlfriend are not able to stay in shelters because of their dogs, but they are finding kindness on the streets. Finnegan and his girlfriend were staying downtown, but quickly found sleeping outside would get them in trouble. “The cops were a lot meaner downtown,” Finnegan said. He and his girlfriend have found a more amiable population in the Siegen shopping area. Taylor said that anyone could end up homeless due to job loss or a house fire. For Taylor, helping these people is more than just a nine-to-five duty.